Finally got around to uploading a few photos Ristin and I took at FurDU 2013. 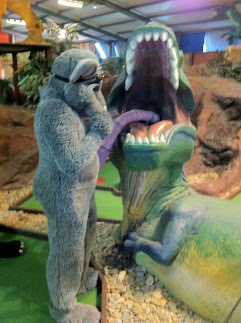 Hendikins took a lovely photo of Rattus and I at the mini-golf. Rodents are nature's chicken nuggets. ^_^ Everybody eats 'em. Kangaroos are supposed to be herbivorous! Yes Strickly speaking Kangaroo's are herbivorous. However Red Kangaroo's and Euro's(Wallaroo's) will suppliment there diet with carrion is food is short. Many years ago I saw a red Kangaroo Joey eat some chicken meat with no ill effect, That's where I learned the above fact. But... people like plump rabbits! That just means there's more to cuddle. Or are you working towards fitting into a particular suit?